I am pleased to announce that the United Nations Development Programme (UNDP) conferred the Equator Prize 2014 on the Pendeba Society at a high-level ceremony at Lincoln Center in New York, US, on 22 September 2014, as a kick-off to the UN Secretary-General's Climate Summit. The Prize is awarded biannually to recognize and advance local sustainable development solutions for people, nature and resilient communities. As local and indigenous groups across the world chart a path towards sustainable development, the Equator Prize shines a spotlight on their efforts by honoring them on an international stage. Following a global call for nominations, the Equator Initiative received a record-setting 1,234 nominations from 121 countries around the world. An extensive review process guided by the Prize’s Technical Advisory Committee of international experts was undertaken over the last several months, concluding with the announcement of the thirty-five winners. Against a highly competitive process, the Pendeba Initiative was awarded the prize. 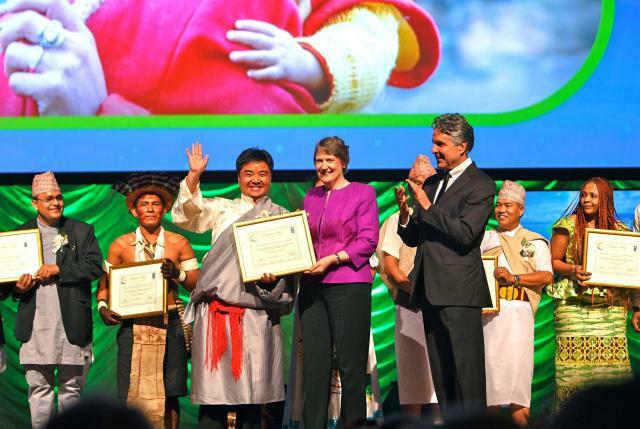 In support of the UN Secretary General’s Climate Summit and the World Conference on Indigenous Peoples, UNDP and partners hosted the Equator Prize 2014 Award Ceremony at Lincoln Center on Monday, 22 September 2014. Attended by more than 2,400 people, the evening was a celebration of leadership by indigenous and local communities working to meet climate and development challenges through the conservation and sustainable use of nature. The Masters of Ceremony were Connie Britton (Actress and UNDP Goodwill Ambassador) and Edward Norton (Actor and UN Goodwill Ambassador for Biodiversity), each of whom congratulated the Equator Prize 2014 winners and appealed for greater recognition and empowerment of indigenous and local communities in meeting climate, development and environment challenges head-on. 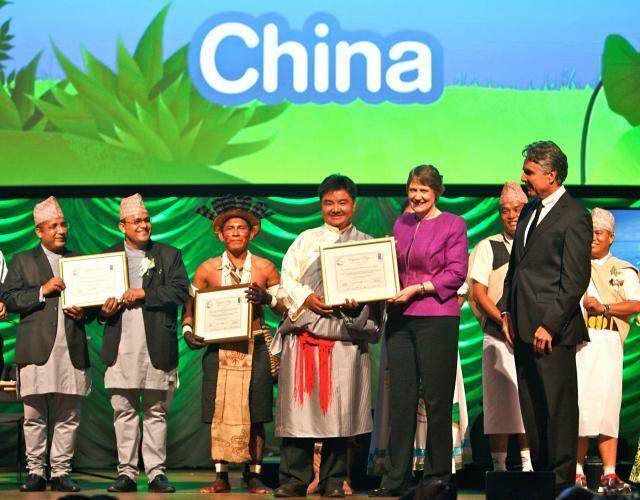 Helen Clark, UNDP Administrator bestowed the Award Certificate to the winners, and Al Gore, former US Vice President gave keynote address for the event. As a winner, I am pleased to represent our country, my fellow Tibetans, and all the Pendebas who are dedicated to the cause of environmental protection in Tibet to attend this exciting ceremony. I have participated in many a such activity, but this time it is one of the most impressive ceremonies for me, because it is not just a grand ceremony organized by UNDP, but it also serves as an important worldwide platform for the Pendeba Society to shine. After the award ceremony, I was glad to meet four young ladies from China, and two of them were Tibetans. They also felt very happy to see our award-winning, and said it was a pride of the Tibetan people and the pride of the Chinese people. For us, the Equator Prize does not mean "a form of encouragement" and "a high honor" alone; more importantly, it shows that our initiative has gained global recognition for international philanthropy. As former Director of Disaster Relief Department, Ministry of Civil Affairs, Mr. Wang Zhenyao said, this is an honor for the Chinese philanthropy. This is a milestone in the history of the Pendeba Society, which encourages our future work on environmental protection and sustainable community development. By participating in this event and other learning activities, not only have I learned a lot of knowledge, but also got to know many new colleagues who work on similar issues. Since the establishment of the Pendeba Society in 2009, our projects have won tremendous support and praise from local governments and stakeholders, and in just a few years we have received more than a dozen awards. Our achievements could not be made possible without active participation and support from governments, fellow colleagues, and local communities. We are very much appreciative of all the participants in the Pendeba Initiative, who have contributed to our today’s accomplishments. Finally, I would like to thank our longtime supporter: Future Generations and LAO NIU Foundation, recommenders for the Equator Prize: Mr Chen Taiyong, Country Director, Haifer International China, and Ms Zhang Junzuo, PMO Team Leader, UK-China Collaboration on forestry investment and trade, as well as my capable assistant, Mr Liu Rongkun, Program Manager of the Pendeba Society for their efforts!